Elle is an American teen who is down on her luck. This isn’t the bad grade, missed curfew, wrecked a car kind of luck. It is the non-present dad, mom in jail, living in foster care, life is tough – kind of a break. But like a fairy tale, Elle is given the opportunity to move to Tokyo to live with her wealthy hotel tycoon father. Elle navigates culture shock and tries to discover what her place is in an unfamiliar country, as a student in her elite international school, and as a member of a new family. While encountering different expectations, cultural practices, and traditions, Elle struggles to reconcile her past with her present. Given the opportunity to reinvent herself, Elle finds a place among the popular group where she has to choose whether she will stay true to herself. I found the characters entertaining and at the end of the book I wanted to know more about their stories. Currently, though this is just a standalone novel. 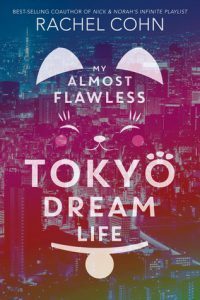 My Almost Flawless Tokyo Dream Life is relevant not only to the members of an international student body but to anyone who has moved to a new place and had to figure out how to fit in. Find it in the Teen section of the HS/Adult fiction. This entry was posted in What We're Reading and tagged fiction, randi brown, YA by Randi Brown. Bookmark the permalink.